At the usual orcs do lack the engineering skills to bridge rivers or moats during a siege, orcish armies sometimes find themselves with no option but to attack through the water, hoping to swarm the defenders through sheer numbers. If necessary they will, according to some accounts, send wave after wave of attackers until the corpses of their fallen form a macabre causeway for their attack force to use. This is almost certainly an exaggeration, however; orcish armies often employ teams of skilled swimmers to spearhead attacks over water and form a beachhead. 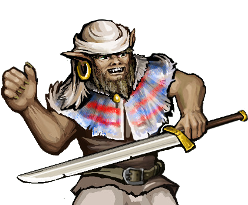 Although lightly equipped by necessity, orcish marines are veteran troops and highly competent fighters on land.